Welcome to Farmer's Herbs. Home of the Herbal Sachet Pillows. We offer decorative herbal pillows with herbal blends that are specially formulated by an herbalist and an aromatherapist. Our herbal pillows are available with an array of decorative design options and herbal blend options. 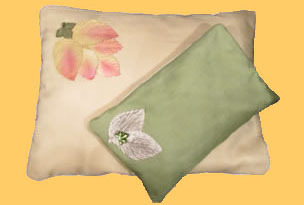 Customize your own herbal pillow with Farmer's Herbs. Choose your desired combination of design and herbal blend from our variety of options. Experience the purest nature based herbal scents with your customized herbal pillow. You can relax into comfort any time and in any area of your home with the pleasing scents of the Farmer's Herbs Herbal Pillows. All the Farmer's Herbs Herbal Pillows are made to order to ensure the maximum freshness of each herbal pillow that you receive from us. Every Farmer's Herbs Herbal Pillow is made in the USA. To view the herbal pillows, click on the button below to visit the Farmer's Herbs Herbal Pillow Gallery.